What should I replace 2005 S60 with?? Hi all, I'm 3 years into ownership of a 2005 S60 D5. It's still an excellent car and nothing has gone wrong with 156k miles now on it, new callipers all round and new wishbones recently plus usual wear and tear items. It passes MOT's without fault. Not quite got the funds to update just yet but no harm in looking. Looking at 2010 onwards if I was to upgrade, still diesel to keep the tax down and efficiency up. I want the same or more power as I've got used to the 163 horses and their umph and SE spec or above, nothing Spartan. I want to spend around 5 grand on maybe newer S60, V60 or S80. I'm hoping people can put their two-peneth in and give some feedback on these models, good and bad. Or tell me to keep the old girl! S60 D5 SE 163 manual, 2005, 156k miles. My first Volvo and I love it! S80 D5 SE Lux auto, 2006, 63k miles. 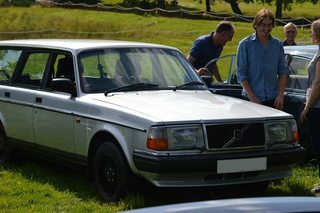 My dad's first Volvo and he also loves it! Honestly, keep it. Sounds like you have a good one there. You already have the most fuel efficient of the D5s. The 185 will not match it and the P3 205 with twin turbo will empty the tank as you watch with the big turbo spinning. I had a 2.4 tdi P1 140 bhp v70, 45 mpg around the houses 53 mpg on a motorway run. Now have a 2.4 D5 xc70 2wd 175bhp with polestar to 195 single turbo.40/42 mpg around the houses and have seen 58 mpg running light on motorway. Use the extra 50 horses and the smile is as big as the bill. Unless there is a very pressing reason to change I would keep what you have and know. I changed as I was starting to struggle getting out of the v70 and was spoiled by the ease of egress from the discovery. It sounds as though you've got a car that is really worth keeping. The crossclimates really make a huge difference on these cars both in the terms of ride comfort and their remarkably quiet performance. The grip in snow is superb, much better than much of the competition. What they said. 2005 S60 with 142k miles here, and I have no intention whatsoever of changing it as it's as fresh as a daisy, does 50mpg all day long, and I have complete confidence in it. Guys is the only the winter tyres that you have to have on all four wheels, doesn't matter if cross climate types? Keep it. The newer shape S60 just isn't the same, being based on a Ford chassis and all. Check out the progress on my cars!